The village of Brancion is situated between Cluny and Tournus in the southern part of the Saone-et-Loire department of Burgundy. 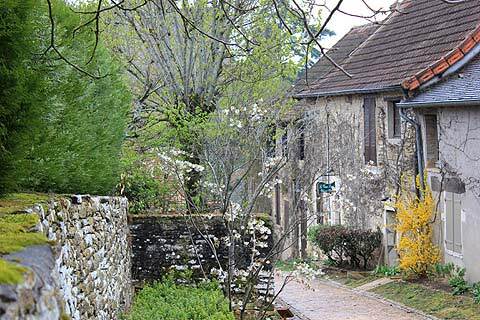 In recent years the village (called Martailly-les-Brancion) has undergone a great deal of improvements and renovations, and is now recommended if you are visiting the region. 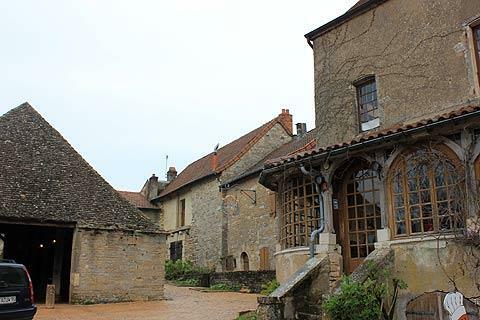 From the 13th to the 15th centuries Brancion was an important regional centre for the Dukes of Burgundy, and the interesting buildings in the village date from that epoch. Later the village lost its importance and Brancion became a quiet backwater for the following five centuries. At the turn of the millennium the village made a conscious decision to make the most of its important buildings and attractive character, and spent several years on renovations and improvements. Pass through the gateway in the original village fortifications and inside you will find several attractions, not least of which is simply the chance to stroll through the streets of the historic village itself. 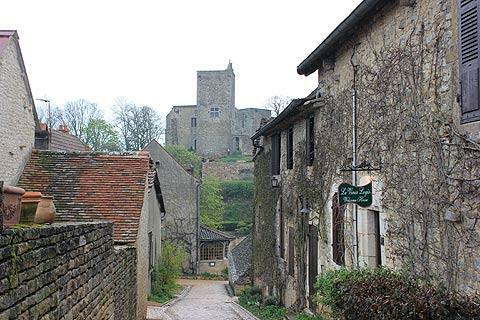 The main monuments of historical importance in Brancion are a medieval church and market hall, and the castle above the village. Only residents are allowed to drive in the village and so there is a car-park just outside the village. The entrance to the village is by the castle which is a short climb uphill from the village. In the other direction Brancion winds gently uphill past its magnificent market hall to the Eglise de Saint-Pierre at the top of the village. The traditional market hall with its magnificent carpentry work dates back as far as the 14th century and is unusual because it is also has low walls on all sides. 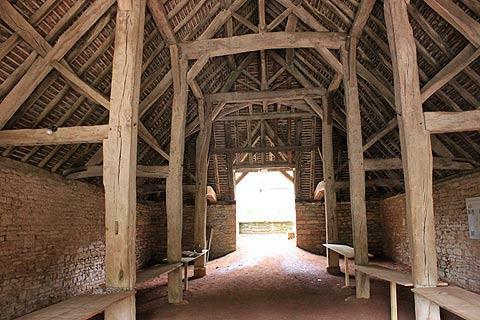 The hall is huge and has a large deeply sloping roof which dominates the centre of the village. The most important monument here is Brancion castle that stands above the village itself. 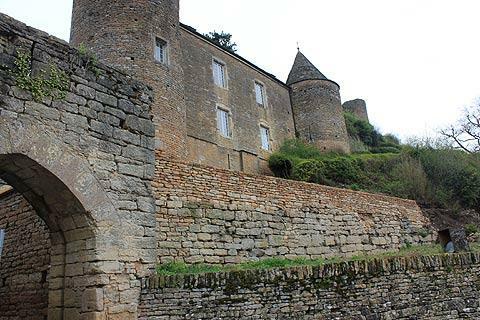 The oldest section of the castle, a part of the original logis, dates from the 10th century, while the other parts (quite extensive and substantial ruins) and the donjon were added in the 12th - 14th centuries. In the castle you can see the living accommodation, two towers and the donjon - from here you can see the best views across the Grosne valley, and there is a sign to explain what you are looking at. The Church of Saint-Pierre is also a listed historic monuments. Located on the rocky ridge above the village it dates from the 12th century. 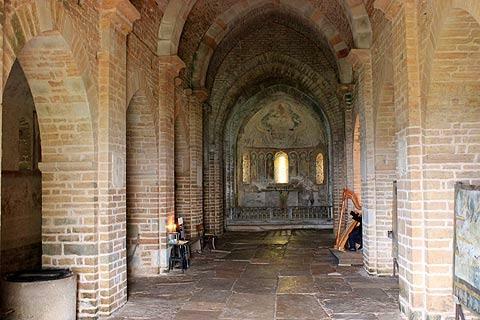 It is a particularly fine example of 11th century Romanesque architecture. The chevet and tower are the most imposing elements outside while inside you can see the impressive murals inside the church, added several hundred years after the church was originally built. The murals really are very impressive. One I particularly liked, 'Women rising from the dead' had a particularly modern style, amazing to think it was painted centuries ago. The raised position of the village mean it also has extensive views across the Grosne valley and the Burgundy countryside. Walking around the village is made even more pleasurable by the lovely planting that has been introduced throughout the entire village. With an underlying theme of grey leaved plants the planting was attractive when I visited in early April but will be wonderful in another month or two! There is a 1.5km walk around the village and surrounding countryside which is worth doing. Pick up a leaflet to see the route. The walk first takes you above the village to the 'Four de la Baume' cave which excavations have revealed was inhabited from prehistoric to medieval times. The walk continues past the ramparts, the traditional location of the Celtic fires which took place in Brancion around the time of the summer solstice. 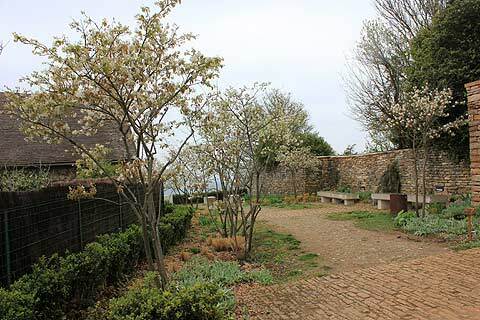 The Paradis promontory, on the walk, gives you the best views over the countryside. 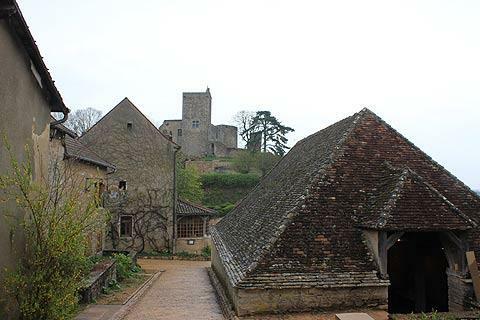 Various guided tours of Brancion are available (summer only), and there is parking available below the village. The impressive Chateau de Cormatin is not far from Brancion. 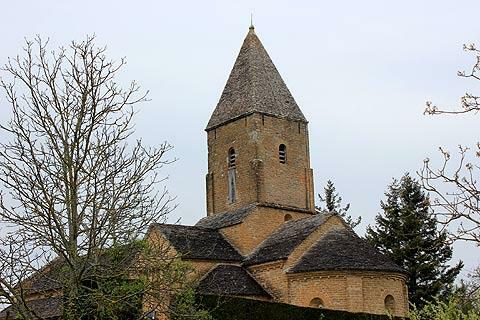 Other Romanesque churches in the area can be seen at Tournus and Ozenay, and the abbey at Cluny is one of the most famous roman style abbeys in France. You can find more local travel ideas in the Saone-et-Loire guide and the Burgundy guide.